A new documentary — focusing on the ethnic mix of Boyle Heights and how the construction of a freeway nearly destroyed the neighborhood — is drawing the attention of educators as a way show how the east LA neighborhood once stood as a monument to diversity and community strength. “East LA Interchange” debuted at a packed screening at the Downtown Film Festival last weekend. Afterward, the teachers appearing in the film, and many educators in the audience, expressed interest in showing the film to their students. 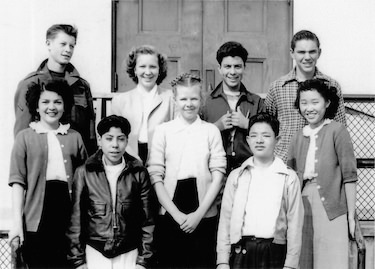 What drew her to the story was finding school class photographs going back to 1926 with ethnically-mixed students attending Roosevelt High School, Hollenbeck Middle School, Garfield Senior High School and Belvedere Middle School — all LA Unified schools. “People lived next door to each other in the neighborhoods, but it is at these schools where they became friends and they mixed,” Kalin said. Principals and teachers at the schools helped Kalin and her team with the project. Roosevelt High was nicknamed the “United Nations of schools” because for decades it often had more than 100 different nationalities among the student population, Kalin discovered in her research. Retired Roosevelt High teacher Howard Shorr is featured in the documentary, and he taught the first-ever Boyle Heights History class beginning in the 1981 to expose students to the local diversity of the past. 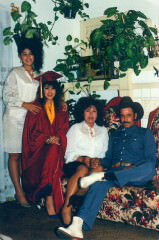 Roosevelt grad Nancy Romero and family 1980. Photo by Bluewater Media. “The students that did research and history on the neighborhood at that time have become successful lawyers, doctors, judges, writers, educators and community activists,” Kalin said. It’s been less than a week since she first screened her film and only a week before that the eight-year passion project was completed. Now, she is seeking an education distributor for the film and looking for grants to help her translate it to Spanish and Japanese. To help with that, she has professors on her advisory team, including George J. Sanchez from USC, Sojin Kim from the Smithsonian Institute, and many past and present teachers as well as local historians. The movie is narrated by actor Danny Trejo and includes interviews with will.i.am from the Black-Eyed Peas, Father Greg Boyle of Homeboy Industries, playwright Josefina López of “Real Women Have Curves” as well as many local politicians from the area. The movie shows the evolution of working-class, immigrant Boyle Heights from multi-ethnic to predominately Latino and a center of Mexican-American culture in the United States. The documentary is peppered with photos from the schools, including rallies, walk-outs and protests that went on at the campuses. And, will.i.am is shown at Roosevelt High talking about how he lived across the street from the school. “My friend was saying to me, look at you you’re living behind a laundromat with your Grammy,” the singer said.